YouTube is the largest video platform on the internet currently and it accounts for almost 20% of all internet traffic with 1.9 billion monthly logged in users. By 2021, It’s estimated 82% of all internet traffic will be video. Mastering the platform and developing your advertising strategies for YouTube can be a key to your success. Behavior - channels usually adopt at least one of three behavioral types; Hero, Hub or Help but can be best served by operating as all three. These behaviors are based on how users browse the platform. Hero channels focus on putting out content for big events like product launches or tieing into relevant events like the Super Bowl or the Olympics. Also think of brands like Redbull with stunts sponsored by them. They are also meant to engage watchers with meaningful or emotional stories. Hub channels offer regularly scheduled content. They provide thematic content usually related to the brand. If you were an outdoor outfitter, you may feature hiking and climbing videos with personalities using your products. This content is mainly meant to entertain and keep audiences regularly engaged. No matter the content strategy being employed, it’s important content is creative. Potential consumers will tune out if they’re bored. ROAS will be negatively affected as well as possible future purchases from brand association. Once you have a content strategy, you need to know how you plan to reach your prospective customers. YouTube offers custom targeting to help reach the appropriate users and increase your ROAS. You can target based on Demographics like age, gender, income, and more. This is great for generating general brand awareness, especially for new services and products. Targeting can be further narrowed down to Interests and Habits. This is for audiences who may already use similar services and products, but you would like to convert to using yours. For example, targeting people into cooking shows in order to get them to buy your cookbooks or appliances rather than competitors. Your reach can even be further pinpointed for audiences who have the Intent to make purchases in the near future. This can be based on life events, recent web activity indicating they’re in the market, or previous customers. For high-intent audiences, video can serve as the tipping point in their awareness and understanding of your product. Demonstrations and reviews can sway prospective buyers when massive text returns on search results may go largely ignored. YouTube maintains the highest watch and listen rate of video ads on the internet. It’s important to know YouTube has a 95% audibility. People aren’t just watching, they’re listening. Compare this to Facebook’s 30% where video plays are by default muted. This doesn’t mean your ad will be automatically watched or engaged though. Be aware of the following to maximize ROAS. Ad Length - Ads on YouTube are skippable after 5 seconds. Meaning you have 5 seconds to get your message out or at least hook your audience. In general, it’s best to plan your full ad to run within 15 seconds. Ads can be longer, but it’s still advised your Call to Action, Branding, and Offer be frontloaded. Optimize for Mobile - The majority of ad views are on mobile. Make sure text and relevant graphics are large. Use bright imagery to attract attention and keep watchability up. 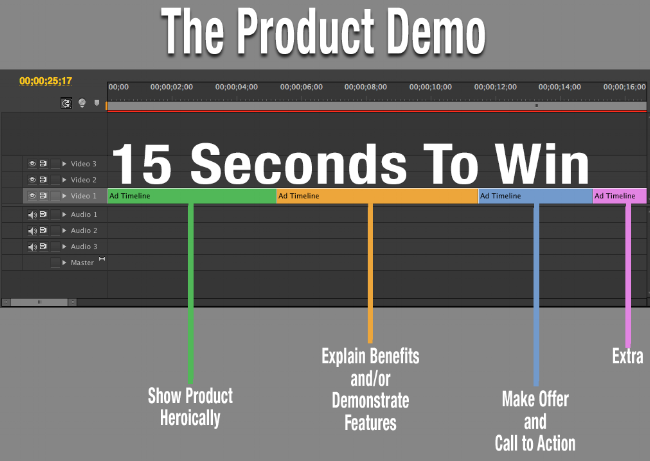 Try to follow one of these three timelines for the first 15 seconds of your ad. Again, ads can be longer, but you’re going to win the most engagement if viewers understand your product and offer before they can skip. The Explainer - The classic approach relies on a strong problem statement to setup the product as the solution and explains its benefits. Problem Statement > Introduce Product as Solution > Explain Benefits > Make Offer and Call to Action > More For Those Who Want It. Consider taking advantage of YouTube’s TrueView ad format. More costly than regular campaigns, but they include clickable links which drive traffic directly to your actionable sites like a Buy Now button. Google offers premium tools for creating ads either from scratch or from longer content with a focus on TrueView ads. All of Google’s platforms have tools for tracking the performance of ads. YouTube can track conversions through your TrueView ads, as well as website visits and brand searches after ad exposure. Google also offers brand lift surveys which measures your ad audience against those who organically find your brand. It also will show you how likely your audience is purchase from you. For the best results, try to upload videos encoded to fit YouTube’s standards. If you’re not editing your videos for your product and channel, you can ask your editor to abide by these guidelines. Codec: H.264 - a non-interlaced video format that goes hand in hand with .mp4 encapsulation. The progressive scan encoding helps guarantee your video displays properly on most modern displays whether they be TVs, phones, tablets or computer monitors. Interlaced formats maybe encoded wrong when uploaded to YouTube and present jagged lines or visual glitches when played back. Audio: Stereo at 48kHz. Ensure your audience can hear your audio in both channels. A lot of your audience is going to be on a mobile device, and some speakers only support mono audio playback. Without the aid of headphones, a lot of your message could be lost if it’s only played through one channel. YouTube on desktop uses a 16:9 aspect ratio player. The player automatically adds black bars to videos so that they are displayed correctly without cropping or stretching.